This computer animation uses real astronomical data to envision a trip through globular cluster NGC 6752, revealing the partially obscured dwarf galaxy Bedin 1 behind it. The cluster of small stars along the left of this photo is the newly discovered galaxy, Bedin I, while the large stars in the foreground belong to globular cluster NGC 6752. Image: NASA, ESA, Bedin et al. Bedin 1 is located in the Pavo constellation, which is visible in the Northern Hemisphere. 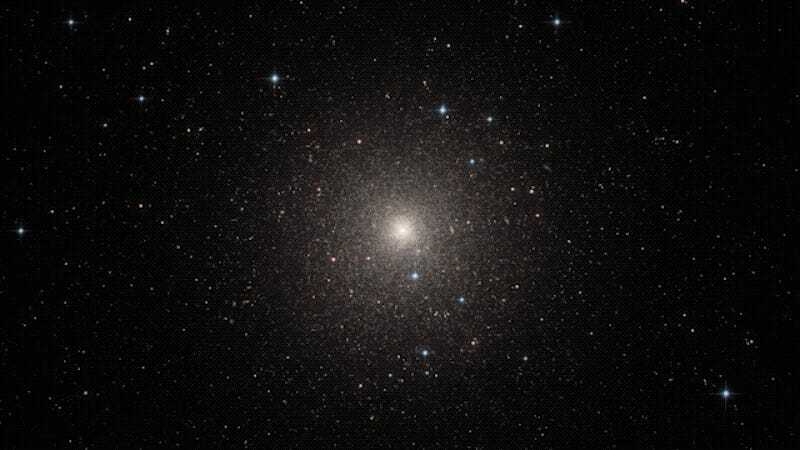 The diminutive galaxy hasn’t been detected until now because it’s obscured by NGC 6752, the globular cluster that Bedin’s team was investigating. Specifically, they were analyzing white dwarf stars within NGC 6752 to measure the age of the cluster, which is located approximately 17,000 light-years from the center of the Milky Way. Using the NASA/ESA Hubble Space Telescope, the astronomers began to notice that some stars along the outer fringes of the globular cluster were out of place, leading to the accidental discovery. The astronomers quickly realized they were looking at a previously undetected galaxy—a compact collection of ancient stars measuring 3,000 light-years across and situated 2,300 times further away than globular cluster NGC 6752. Bedin I was classified as a dwarf spheroidal galaxy owing to its small size (it’s about 1/35th the diameter of the Milky Way), low luminosity, lack of dust, and population of old stars. To date, some 36 galaxies of this type have been documented in the Local Group of galaxies, according to a Hubble release about the discovery. A composite image showing the location of Bedin 1 behind the globular cluster NGC 6752. The lower image depicts the complete cluster, the upper right image shows the full field of view of the area obstructing the dwarf galaxy, and the upper left image zooms in even further to show Bedin 1. As a final note, Bedin said he pleased with the galaxy’s new name, saying it was “nice to adopt a nickname from one of its discoverers instead of an anonymous identification based on its coordinates.” Hard to fault him on that! Those dreadful numerical designations, while utilitarian, are often quite silly. No harm in giving catchy names to cool things, and by consequence, honoring the researchers involved.